This has been a different type of week for us, fairly unschooly with a few of our normal lessons thrown in. We aren't quite sure how much we like this type of learning, but it fit the bill for what was needed. 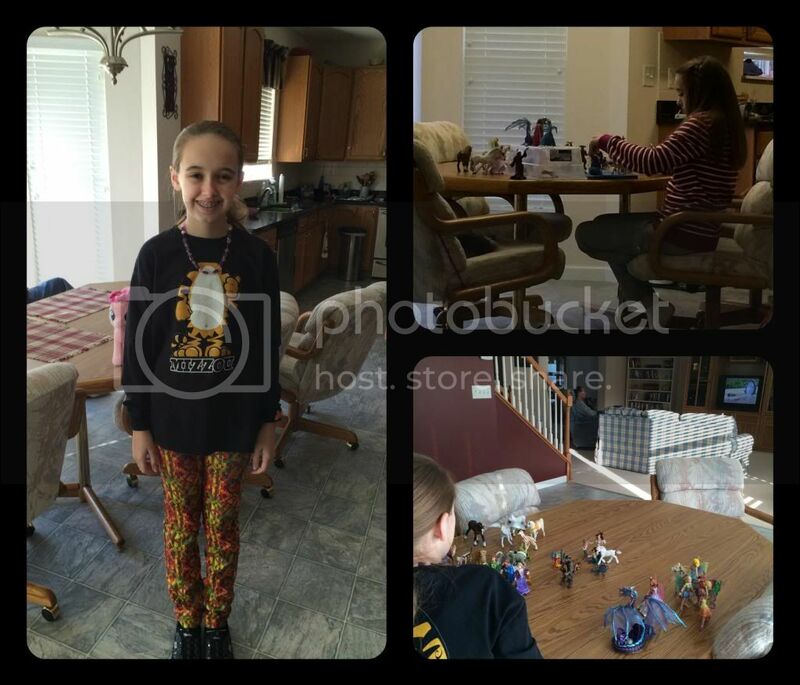 I've mentioned before that Amber has quite a few activities away from home which are greatly fulfilling to her. Unfortunately, that also means when she is sick there are a lot of decisions to make about what she can attend. 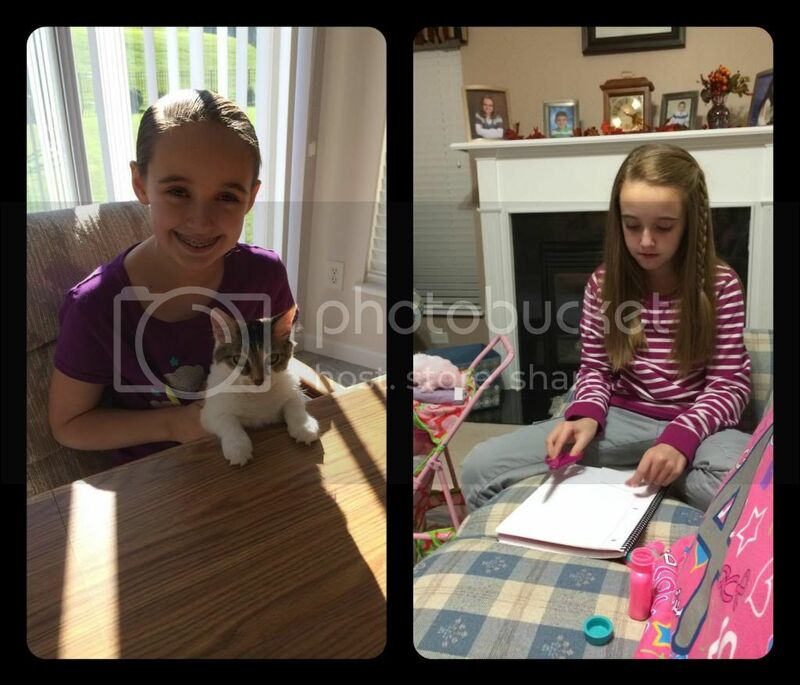 This week Amber only made it to her flute lesson and we chose to keep her home for the rest of the activities. Thankfully, it was our break week for art classes so there was no concerns over that one. Academically, there was no official lessons Monday or Tuesday. It felt quite odd to have Amber ask what was on the schedule for the day and to only wave my arms and say "nothing.. just do what you want." More later about what drove me to those responses, but it wasn't entirely by choice. (LEFT) Dressed to support her cousin's beloved Mizzou! Wednesday through Friday Amber completed roughly three subjects a day and it felt like a huge accomplishment. During those days Amber managed to complete 2 weeks worth of biology, putting us ahead now of our completion goal date. She also completed an entire week's worth of logic assignments, keeping her on track for finishing before Christmas break. Way to go kiddo. Amber also finished weeks work of history reading, yet only completed two lessons that I had scheduled. She is entirely fascinated with Egyptian mythology, enough to do quite a bit more reading on her own. I only scheduled about half of the Egyptian encyclopedia in our study, but Amber read the entire book in her free time. Cover to cover. There was also the new Egyptian mythology book that I pre-ordered from Amazon a while back. I had completely forgotten about it until it arrived on our doorstep Tuesday evening. That was a nice surprise for us both. Amber spent some restful time reading through the new mythology book and comparing it to other sources. She didn't do any written comparisons like I had originally planned when ordering the book, but without prompting she discussed with me the differences in the myths depending on the source. So instead of working on writing skills, we worked on oral discussion skills. Works for me. 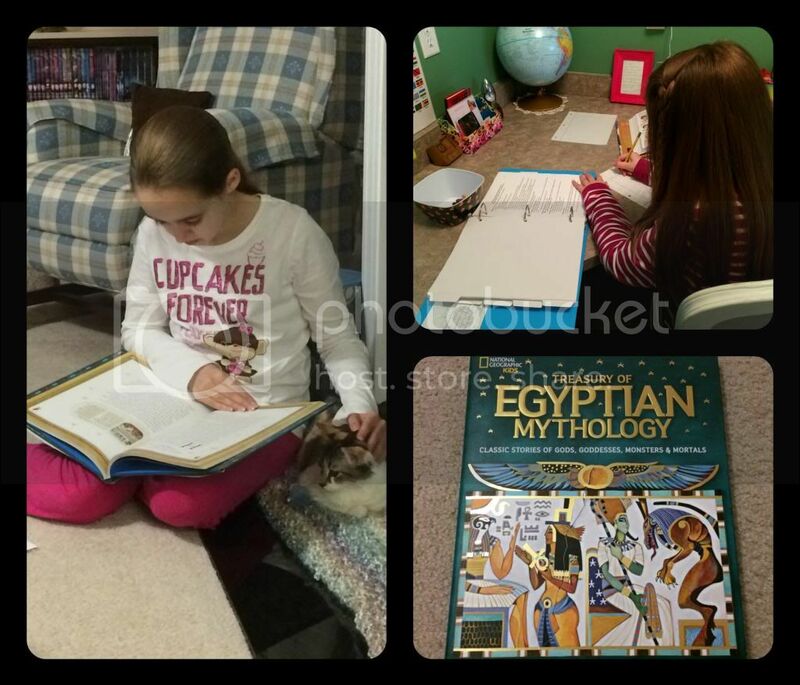 Reading her new Egyptian mythology book and working on biology. In history we've finally left ancient Egypt behind and started the Myceans, moving toward Ancient Greece. The timing was perfect as we began the Aeneid in literature today. Again, this won't be as formal as I had originally intended, but we will still have some good oral discussions of the book. Next week was to be one of our break weeks from school, but given how little school has been done this week (and honestly, the week before too), we are going to give up our break in favor of school days much like the past few days have been. Now the reason for this all, as you probably have guessed, is Amber's health. Things aren't going so great in that area. Last week we were awaiting the results of the array of Crohn's tests with the presumption that it was probably the cause of Amber's problems. Friday evening the GI doctor called our house with partial results from the capsule endoscopy - it is not Crohn's. The doctor did not want to wait until Monday to get things going after what she saw on the camera images. Actually, she hadn't even finished looking through all the images, just far enough to see something of significance. Amber still has the inflamation in her duodenum that's been on every scope since April. However, the capsule endoscopy showed portions of the intestines that the scopes could not reach. The short of it is: there are folds in Amber's intestines. This would be the source of pain, most likely. The cause of these folds however is still unknown. Thursday, a good day. Amber did a little school and then played doctor with her stuffed animals. Very low energy use activities. The GI doctor wanted Amber to complete a 24 hour urine test over the weekend because the results take about a week to be returned. So, guess who didn't get to go anywhere all day Sunday. Yep, Amber or me. The urine test looks for an auto-immune disease that could cause the folds. Don't ask, I don't know any more than that. The doctor has been vague-ish, and I've promised Fred I won't do any Google searches on the condition. 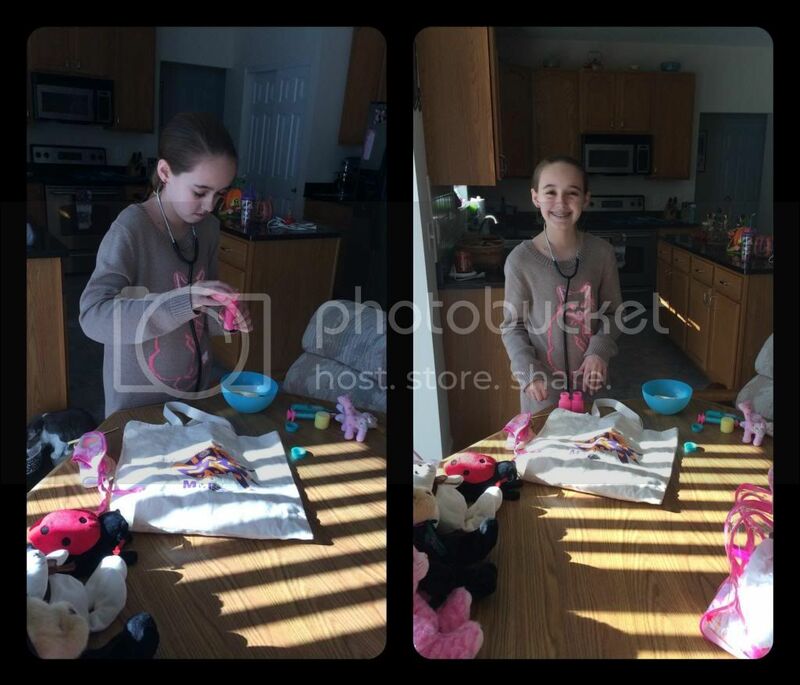 Amber also went through a CT scan with contrast on Wednesday. This test required that she drink three large glasses of barium then have the IV contrast used during the scan. To say that this test went poorly would be an understatement. Amber refluxed the barium again and barely got enough down so that they could complete the scan. She also went sheet white and nearly passed out from the IV insertion. We are still awaiting the results of the CT scan, but we do know that it was looking for a tumor as the cause of the intestinal folds. Monday the GI doctor almost had to admit Amber to the hospital for pain management. She had become weak and lethargic. She wasn't sleeping well at all due to the pain, both in her intestines and her head. Amber has begun having daily migraines now too. Thankfully, the anti-spasmodics are helping with the pain and Amber has been able to get some rest. She is never without stomach /intestinal pain, but it is being managed better (as I write this she has just come out to tell me that she can't sleep for the pain... sigh). Amber has been very fuzzy headed, thus another reason we have skipped school. It's a little silly to push learning on someone who can barely string sentences together at times. 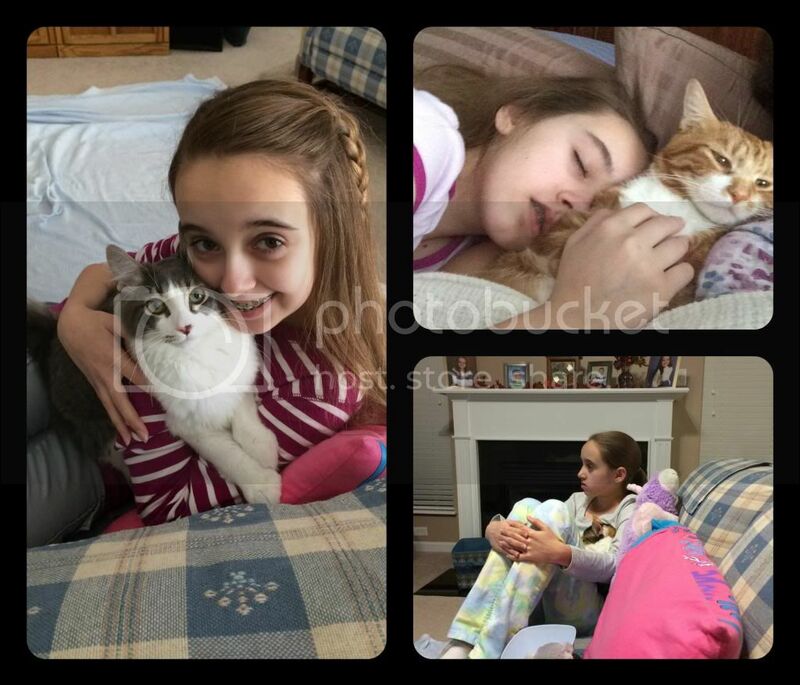 A sick girl and her cats. As for my new and improved healthy life style. LOL! So, I haven't worked out for two weeks straight now. Instead I usually lay down with Amber at night to help her sleep. Then, I spend most of the night awake worrying about Amber. The processed food is definitely way down (sorta), but so are the fruits and veggies. I've noticed that I'm not eating much different from Amber, except that I sneak a miniature candy bar now and then. My weight is down about three pounds, but that's not actually good in this case. It's basically from not eating. I did go to my new primary doctor this week who ordered a slew of blood tests that I should have had done earlier. They were just my regular diabetes and other yearly tests they do on me, but I put it off because I didn't want to deal with finding a new doctor. My wonky right hand has moved from fairly annoying to down right painful. Fred swore up and down I must have broken something in the hand / knuckle. The new doctor took one look and shook his head no, not broken. He checked my chart and asked if I have rheumatoid arthritis or lupus. Sigh. He ordered a sed rate blood test too, which thankfully came back low. Here's the kicker, I've been tested, tested, then tested some more for both lupus and MS. Always mild random symptoms but in the end there's no answer. The new doctor says whatever it was before probably went into remission for a while, and is back now. In my right hand.... the one I need. At this point, I wish it was only broken. Relaxation.... I've watched tons of Stargate with Amber, but never totally relaxed. We are a fourth of the way through season 4 of Stargate Atlantis and have finished season 1 of Stargate SG1. While I own all the seasons of both shows, I don't have the time to watch them regularly. It has been enjoyable to go through them again and remember the anxiety of watching them as the seasons unfolded originally. Some good moments from the week. This is going to be a long weekend if we don't get the CT scan results back by Friday afternoon. Part of me wants to call and ask for them. The other part wants to stick my head in the sand and have one more weekend before I know what is wrong with my daughter. I guess I'll just pray really hard for her healing and for patience to let it unfold in God's timing and not force my own. The CT scan came back fine, no tumor! However the doctor is annoying me (that is putting it mildly) with putting off seeing Amber or coming up with any other forms of treatment. She still didn't even think Amber should see a dietician for the fructose malabsorption. I've found a new GI doctor, but Amber can't get in until the end of November. So, it's a waiting game while Amber can hardly function. I need a good scream about now. We are praying. This is such difficult situation yo all are going through. You all are real troopers. I'm so glad they didn't find a tumor but so sad they aren't really "helping" you at the moment either. I'm glad you found a new GI doc hopefully you'll have answers soon. Do they have a cancellation list they can put you on so you can get in sooner if something opens up?? Christy. Glad to hear the CT scan was negative! But equally sad that doctors can't seem to get your little one diagnosed for proper treatment 8(. You are such a strong mom! The Egyptian Mythology book looks fantastic! Sweet girl. I am so sorry that Amber is going through this Christy. And you. She just always looks so happy and content in pictures. I am praying everyday for her and great results. Please know you are in our thoughts and prayers always. Hugs and love!!!!! I am so glad that Amber doesn't have a tumor or Chrohns, but feeling so bad that she still feels so terrible. You guys are going through so much. I wish I had a magic pill for both of your mysterious diseases! Hoping and praying that we get a good report next week.